The Ryounkaku (right) and Asakusa Theater Street, c. 1920. “The Twelve Stories was a popular sight in the urban landscape of modern Tokyo and appeared frequently in commercial images of beautiful women (bijinga), touristic promotional images of Asakusa, and even prints of the Meiji emperor and his imperial cortege engaged in sightseeing activities in the capital. “Built in 1890, at 225 feet, the octagonal edifice with red brick covering a wooden frame was just slightly shorter than the tallest building in the world at the time, the World Building in New York. The tower housed Japan’s first two elevators and had electric lights on every floor, including an additional row of lights above the outdoor roof observation deck. 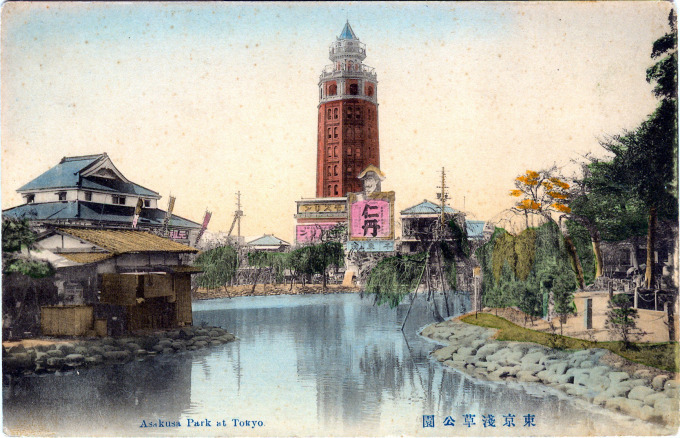 Ryounkaku (Twelve-Storeys Tower), left of center, the tallest structure in Japan 1890-1923, rises above Asakusa Park as seen from Ueno Station, c. 1910. “[A] female beauty competition based on a display of photographs was held at the Ryounkaku, or Asakusa Twelve Stories building, in Tokyo in 1891. Widely celebrated as Japan’s first skyscraper, the Ryounkaku had been completed the previous year. It soared to a height of sixty-seven meters (220 feet) and featured Japan’s first elevator. For the exhibit, Ogawa Kazumasa, one of Tokyo’s best-known photographers, took pictures of 100 beauties, all professional geisha. 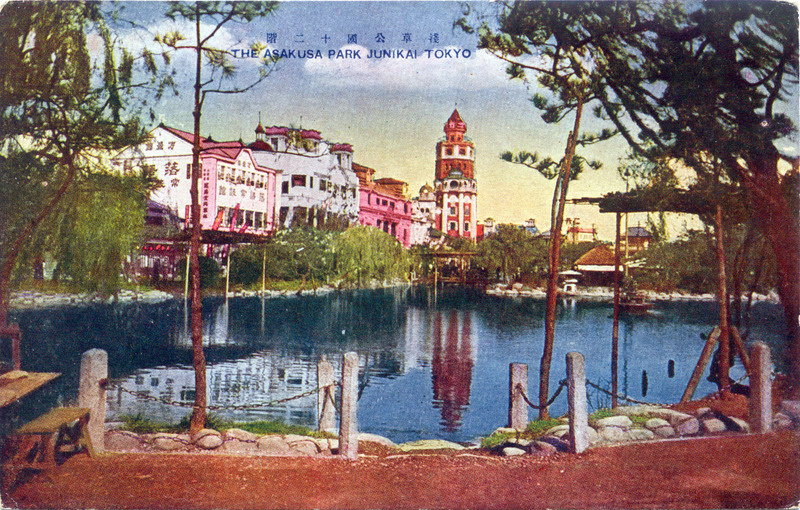 The Ryounkaku at Asakusa, Tokyo, c. 1910. Remains of the Ryounkaku, after the 1923 Great Kanto earthquake. 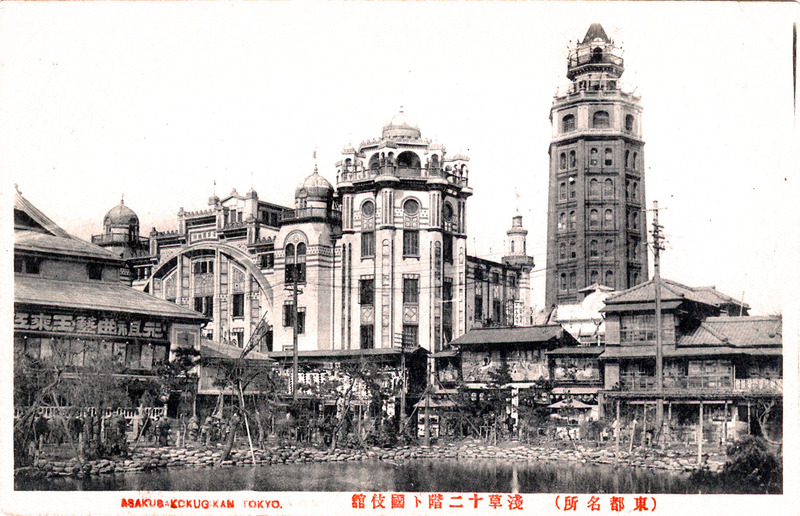 For 33 years, Ryounkaku [cloud surpassing pavilion] towered over Asakusa and the surrounding city. 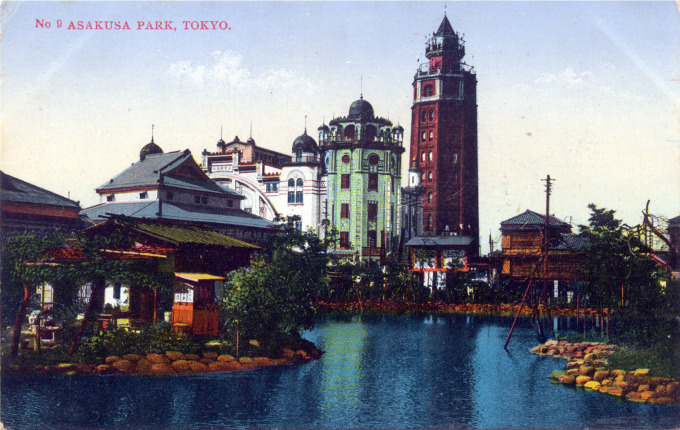 Designed by a Briton, William Burton, built of brick over a wood frame and completed in 1890, the twelve-story Ryounkaku stood out among the more typical two-, three- or four-story buildings that were common in Tokyo. 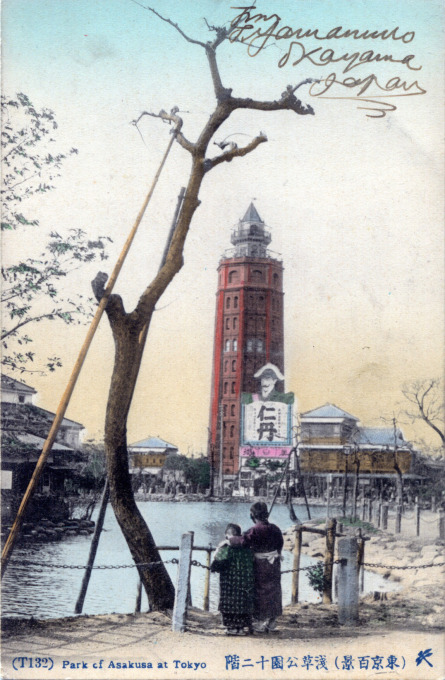 Because of its height, Ryounkaku was also known locally as Ju-ni-kai (Twelve-Storeys Tower). Inside “Twelve Stories” was Japan’s first elevator; the tower was lit on every floor, with an additional row of arc lights perched above the outdoor observation deck. A strong tremor in 1894 weakened the tower, producing a slight lean. In its aftermath, Ryounkaku was reinforced with steel girders. 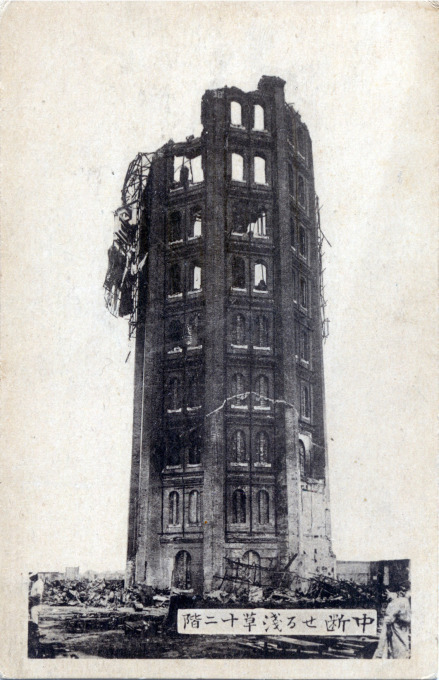 Unfortunately, the reinforced tower proved to be no match for the 1923 Great Kanto earthquake. 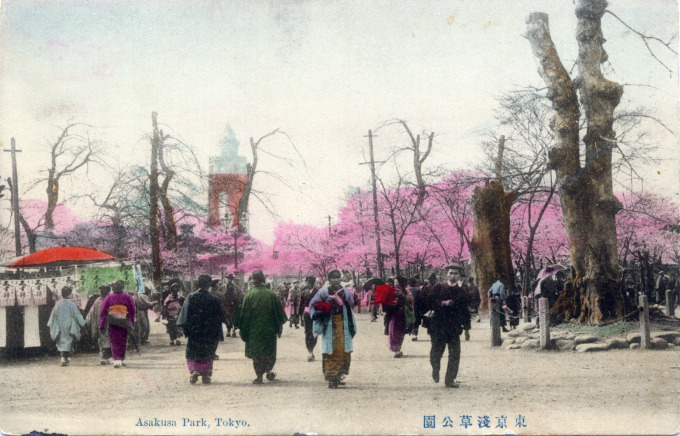 Cherry blossoms at Asakusa Park, c. 1910. Ryounkaku at Asakusa Park, Tokyo, c. 1910. Looking across the Gourd Pond. 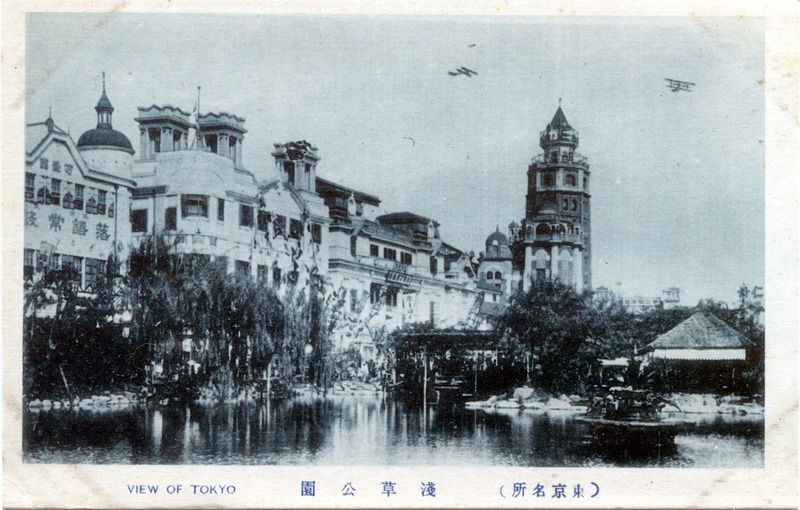 An early biplane flies above the Ryounkaku and Asakusa Park, c. 1920. 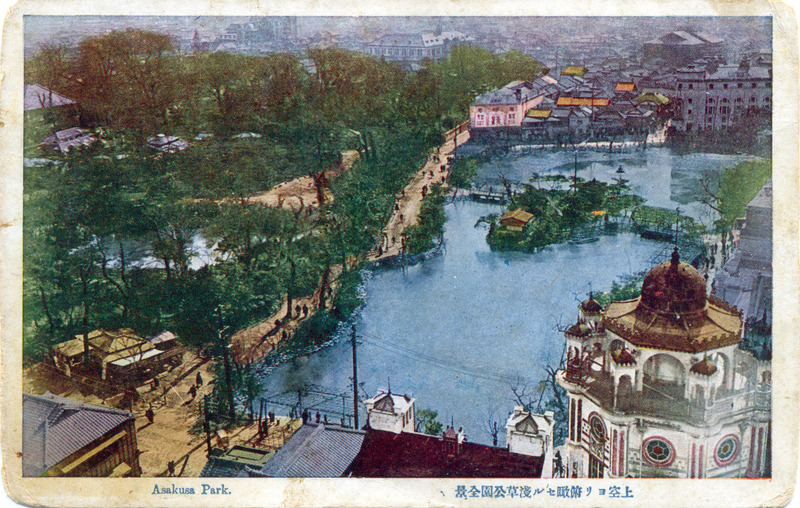 Elevated view of Asakusa Park, from the Ryounkaku, c. 1920. 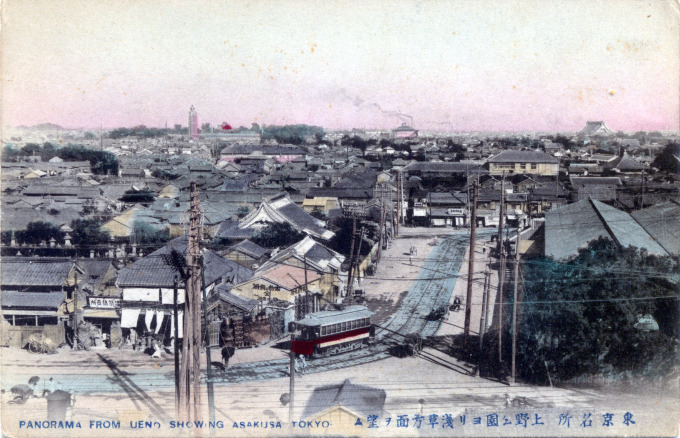 The Ryounkaku and Asakusa Theater Street, c. 1920. The Ryounkaku and Asakusa Theater Street from Asakusa Park, c. 1920.